Sometimes life hands you a little fright to remind you of how lucky you really are. Not that I am in any way unaware of the gems life has strewn across my path…but, as with most people, I am no stranger to trivial discontent and the worrying mind-whisperings it brings. We all fall victim to this, if we are honest, and I certainly am no different, despite my best and most valiant efforts. In truth, however, we truly are lucky. Writing on this blog means I am able to afford a computer, an internet connection, and a camera…luxuries that many Flower shop (too many) in this world cannot enjoy. This being a food blog also means that I have access and am able to procure three square meals a day, even if I need to pinch pennies and cut corners sometimes. My ample curves mean that I am, without a doubt, thoroughly enjoying those three square meals a day, sometimes a bit too much. The ratty leggings I am wearing, which have seen better days, are worn to the quick because I am lucky enough to have a job that allows me to stay at home (and consequently not have to spend my money on suits and nylons like I did when I worked in a bank). To cut a long rambling short, the little fright came in the form on myself landing in the hospital for a couple of days. I won’t bore you with the details; I am doing fine now and well on the way to recovery. I am just nursing myself a bit and feeling a tad more fragile than usual. But that’s nothing some rest, comforting food cube organizers, and tender loving attention from the C’s can’t fix. And for that I am truly thankful. So…that explains the little spot of inactivity over here. It also explains the dearth of cooking (except for one glorious chicken massaged in butter and roasted to divine curative results). It’s times like these when you lean on leftovers (or takeout – yes, I do takeout…don’t judge!) and try to make something of them that is halfway decent in the hopes of affording yourself some nourishment during trying times. This, I am happy to report, was more than halfway decent SKI TRIP. And a wonderful way to use up leftover lamb chops (for example if you had some leftover from this dish), which we all know lose almost all of their luster the day after. This is also a great way to use leftover steak or pork chops, which are similarly dreary when not freshly cooked. Here’s what you do: Chop your leftover lamb into bite size pieces (make sure to include all the fat). In a pan, heat some olive oil, and then when hot add some finely chopped garlic and sliced onion. Cook until the onion is soft and garlic a bit toasty. Add the lamb and toss. Depending on what flavors you initially used with the lamb you can add more here – add some rosemary if you used it, or, if you had made this, add more paprika. Add day old rice and toss, letting it absorb all the flavors. Season with salt and pepper, and a couple of good dashes of Worcestershire sauce. Taste and adjust seasoning. If you’ve got some fresh herbs around, you can add them here. I imagine this would be nice with some just-blanched peas mixed in as well. Tip: If you have leftover lamb chops, pork chops, or steak that you don’t see yourself using in the foreseeable future, just toss them in the freezer. 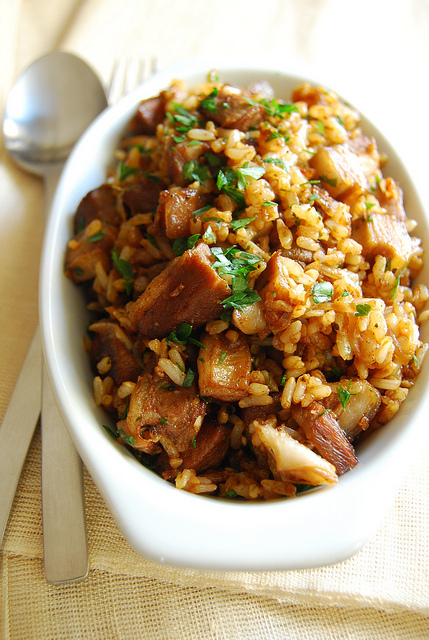 One day, when you are tired and/or busy, you can pull it out and have this wonderful fried rice on your table in no time! Oh, and if you are feeling extra fragile, a fried egg on top of this will do miracles. That’s all for now kind folk! I hope to have more for you soon. In the meantime, let's be grateful for what we have…and use those leftovers!